The complaint of low back painis among the most common medical problems. To begin on the positive side, patients must understand that most episodes of back pain resolve, and usually within a few weeks. Understanding the cause of your back pain is the key to proper treatment. Because back pain is sometimes difficult to treat, a better understanding of the causes of this problem will assist patients in their recovery from back pain. Diagnosis of back pain is generally accomplished by means of a medical history, a physical exam, and sometimes with imaging and lab tests. It is important to realize that diagnosis efforts will never directly reveal back pain. The purpose of back pain diagnosis and testing is to show the normalities and abnormalities of the spine -- the doctor will then correlate back pain signs and symptoms with the results of these examinations to come up with a diagnosis. Very often, doctors can find no anatomical cause of the pain. Additionally, imaging studies might reveal a spine fraught with problems, but the patient experiences no pain. It is important to be thorough and honest when discussing your present condition and your past medical history with your doctor. This is because the information you provide is used as a guideline when planning treatment and selecting specific drugs. Physical examination includes a visual look over for posture symmetry/asymmetry. Leg lengths are also compared, along with range of motion tests and checks for muscle tightness. Range of motion is evaluated with the patient assuming a few basic positions such as bending forward and to each side, so the physician can measure how far you can bend as compared with established ranges for healthy joints. Bone scans diagnose fractures and tumors in the bone by identifying abnormal physiology such as increased blood flow or erratic metabolism in particular areas of vertebrae. This type of test uses injected dye and computer images. Ultrasound or sonography can show soft tissue injury. The technology of ultrasound converts sound waves into real-time visual images. Electromyogram (EMG) measures electrical activity in the nerves that go to muscles and determine if problems in the nerves are causing muscle weakness. Nerve Conduction Studies determine if there is any damage to the functioning of the nerves. Evoked Potential studies record the speed of nerve transmission from the site of origin to the brain. Lab tests are used to find causes of back pain that are unrelated to mechanical or nerve dysfunction. For example (only), if an infection or cancer is responsible for a patient's back pain, lab tests may be done to analyze physiology. Generally lab tests are performed by drawing blood. Muscle relaxing medications can be very helpful in the treatment of some types of back pain. These medications help to relieve muscle spasm, but may also make patients quite drowsy. Physical Therapy Back exercises are the focus of physical therapy. However, there are other modalities that can be used in the treatment of back pain if the exercises alone do not help. Modalities include aquatherapy, ultrasound, electrical stimulation, and others. Manipulations are usually safe, and have been shown to be as effective as more conventional treatments for some types of back pain. That said, there are situations when spinal manipulations can be dangerous and should be avoided. Patients should generally have a x-ray of their spine to assess for lesions or instability prior to beginning treatment of spinal manipulations. In addition, patients who have any leg pain or neurologic symptoms (weakness, numbness, etc.) associated with their back pain should not have spinal manipulations until evaluated by a physician. Massage offers symptomatic relief for back pain caused by muscle spasm. The problem with massage treatments, is that the relief seldom lasts beyond the actual treatment. Furthermore, treatments can be quite expensive. That said, if you find relief from massage, there is unlikely any harm to be caused by these treatments. Narcotic pain medications are excellent at relieving pain, but these can be dangerous, addictive medications. Using narcotic medications must be under close supervision, and only for a limited period of time. Prolonged use of narcotic medication can be dangerous. 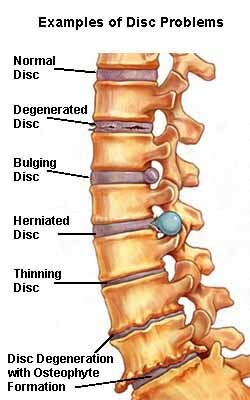 A discectomy is a procedure to remove a portion of the disc that rests between each vertebrae. 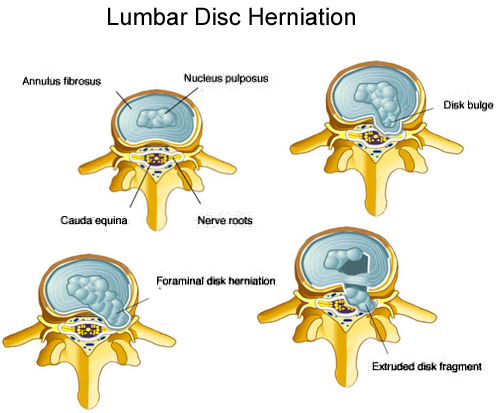 A herniated disc is the most common reason for spine surgery. In this type of spine surgery, the herniated disc is removed and relieve the pressure on the nerves. A foraminotomy is also a procedure used to relieve pressure on a nerve, but in this case, the nerve is being pinched by more than just herniated disc. A foramenotomy removes a portion of bone and other tissue that may be compressing the nerve as it exits the spinal column. A laminectomy is done to relieve pressure on the spinal cord itself. 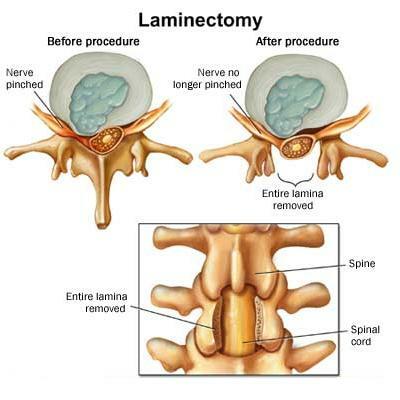 A laminectomy is most commonly used to treat conditions such as spinal stenosis and spondylolisthesis. Depending on the amount of bone removed, this procedure may be done with a spinal fusion to prevent instability. A spine fusion is surgery that is done to eliminate motion between adjacent vertebrae. The spine fusion may be done because to treat a problem such as spondylolisthesis (unstable spine), or it may be done because of the extent of other surgery (such as a laminectomy). Spinal disc replacement is a new surgery that is still quite uncommon. Spine disc replacement is done to treat specific types of back pain, while avoiding the problems associated with spine fusion surgery.